Location: Oughterard, County Galway, Northern Ireland. Ownership / Access: Managed by Dúchas. 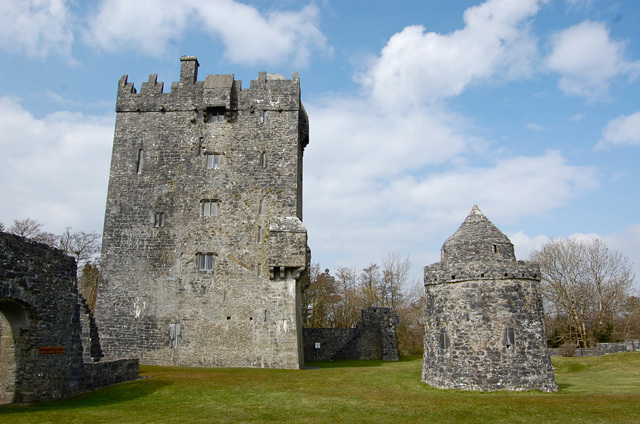 Notes: Aughnanure Castle is a tower house in Oughterard, County Galway, in Ireland. The castle was built by the O'Flahertys in the 16th century, one of Connacht's most notable lord families. Aughnanure is one of over 200 tower houses in County Galway, constructed mainly by Gaelic and Anglo-Norman land owning families. The tower lies close to the shores of Lough Corrib, and translates to "the field of the yews" in Irish (Achadh na nlubhar). The castle was controlled by the O'Flaherty chieftains until 1572, when it was captured by Sir Edward Fitton, President of Connaught, and granted to a junior member of the clan who had been enticed over to the Crown. It was used to blockade Galway during the Cromwellian invasion. Soon after, it was granted to the Earl of Clanrickard, and then reclaimed by the O'Flahertys. It later fell into the hands of Lord St George as the foreclosure of a mortgage. It is now managed by Dúchas, the Irish State body responsible for national monuments and historic properties.